Found via the internet site, user friendly site with ease of access. Very happy with the location to the CBD and RCH hospital. When we found out that the Skybus didn't pickup from the motel location staff were excellent helping to pre-book a taxi the night before required and followed up on the day to ensure it was on time. Staff all very helpful, professional and friendly. It was a pleasure to stay here. When I booked I thought it was going to be a bit noisy but this was not the case staying in apartment 45. Thanks for making our stay comfortable and enjoyable. One of the selling points when booking was having free internet access available. This proved very useful. The apartments were quiet and the hotel provided free undercover parking . Very positive experience. Convenient location, cheap and great customer service . we had a great time. it had everything we needed and was close to all the places we wanted to go. No issues - very convenient accommodation for a short stay. a comfortable motel close to the city. Good location with easy access to the city. Although decor is pretty basic, we are provided with the necessary cooking utensils, microwave and fridge in the serviced apartment. Overall, we enjoy our stay as the staff were helpful and there were free internet and free undercover parking. Thank you for great service! We really enjoyed our stay! convenient , cheap, clean, quiet rooms. close to the City. Close to public transport. Negatives: the lights outside should not be so bright. Please keep up the good work as me and my wife satisfy with your hospitality and hope to see you soon. Please keep me in your promotion loop as i can accommodate myself accordingly. Excellent. Well located, free car parking, spacious clean apartment which had all the cooking equipment we needed. The only problem was that corridor noise carried into the apartment at night. Eg people talking. Excellent. Clean, comfortable, and well located. Excellent. Room was comfortable.Staff were very helpful.Ordered dine in service and this was great. Close to Public transport so didn't have to take car. Good value for money and convenient to city centre. Overall it was a pleasant experience. Fantastic that I could leave my car in a secure area. We enjoyed our stay, only problem we had, was the foldout sofa bed could not be used as the mattress was ripped and the the springs where showing also the springs on the sofa bed where broken. As there was 3 of us staying in the room it was a bit of a hassle. We had a fantastic stay. The only problem was that the shower was leaking at the top when you turned it on. Perfect location for our purposes (Zoo & Hospital) and easy access to trams straight into city. Had everything we needed and a no fuss stay. Simple to book and no hassles. 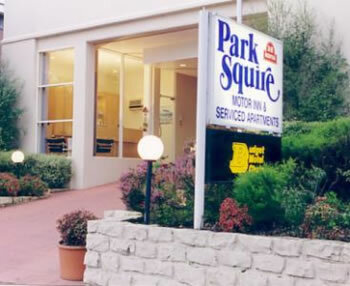 Very surprised with Park Squire motel. Surpassed expectations. Extremely happy with staff. Modern and clean appliances. Secure parking was available. The price was not bad for Melbourne. Nice hotel, good value for money. Only issue was navigating in and out of it because of location on main intersection.